When we talk about college students, we tend to picture kids a few years out of high school. But that image is badly out of date. Today, some 40 percent of college students are 25 or older. Many attend for-profit schools that cost too much and don’t deliver high salaries down the road. Elite schools, meanwhile—the ones that top the U.S. News rankings—enroll very few adults and make almost no effort to suit their needs. There are colleges, however, that are finding creative ways to make educating adults their core mission and are transforming higher education to be responsive to the people—of all ages—who actually use it. 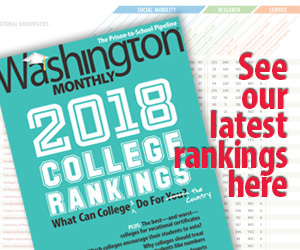 Please join New America and the Washington Monthly for a panel discussion with some of the most innovative leaders in adult education, as featured in the Washington Monthly’s newly-released 2017 College Guide.